At Mobile World Congress 2018, 5G was easily one of the biggest buzzwords thrown around. Now that shouldn’t really be a big surprise, as this next evolution in wireless communication is being touted as the linchpin that’s going to make things like superfast mobile internet, autonomous cars, and armies of flying delivery drones possible. So naturally, every company from the big four US wireless carriers to networking equipment manufacturers and phone makers had something to say about it. Make no mistake, 5G is coming. However, when that tech will actually affect you is a much more complicated question. That’s why I combed the news and spoke to all the major players to find out what you can actually expect from 5G in 2018. Before we get started though, let’s go over a brief history of what 5G is, and how it has evolved most recently. 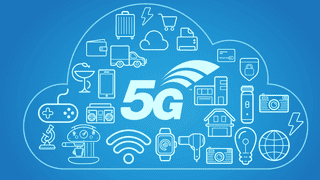 In simple terms, 5G refers to a collection of tech that makes up the fifth generation of wireless communication (though there is a little controversy over how the definitions of generations have changed over time). To make 5G a reality, companies are combinations things like millimeter wave radios that cover the 26GHz to 60GHz spectrum with other tech like Massive MIMO, which is the practice of jamming together 50 to 200 antennas on a single transmitter to offer better bandwidth and capacity. What’s much more clear are 5G’s benefits, which include much faster upload and download speeds that can exceed one gigabit per second, and latency as low as 1 millisecond. And with the help of Massive MIMO, 5G should also be able to deliver these speeds to a much larger number of people and devices, which is critical since pretty much every new device nowadays needs an internet connection of some sort. Now clearly, smartphones would seem to be the biggest benefactor of these improvements, and after the official 5G NR specs got approved late last year, every carrier both in the US and abroad is working on upgrading their networks. Unfortunately, and I apologize for the spoiler, but as far as 2018 goes, the chance that you’ll actually get to use 5G in a mobile device are slim. However, that doesn’t mean 5G will be a complete no show this year. One carrier has promised that it will actually sell a commercial, non pilot-program mobile 5G device before the end of the year. On top of that, in the process of upgrading to 5G capable equipment, it’s possible that we may seen some improvements to existing 4G LTE networks. So let’s take a look at the big four carriers to see what they are really doing with 5G over the next 10 months. At MWC, I talked to Nicki Palmer, Verizon’s chief network engineer, who relayed the company’s plans to offer fixed 5G installations to people’s homes. Unlike mobile 5G, these connections would serve as household’s main broadband connection instead of a traditional cable or Fios modem. The only stated city getting this tech so far is Sacramento, though Palmer said Verizon will extend its offerings to another two to four cities before the end of the year. So far, Verizon has not provided any official pricing or stats on how fast its fixed 5G wireless will be, however Palmer did mention that these home installations would be running off the company’s 28GHz band using the older 5G TF spec (which in large part is what the official 5G NR guidelines are based on). Throughout the rest of 2018, Verizon will work to expand its fixed 5G offerings, while also deploying and upgrading network equipment to support 5G NR before Verizon offers 5G on phones for real sometime in early 2019. Shortly before MWC, AT&T came out with a press release saying it will be the only carrier to deliver an actual 5G mobile device this year. This sounded pretty incredible, so I reached out to Gordon Mansfield, AT&T’s vice president of radio access networks and device design to double check. And while Mansfield wouldn’t provide any specifics about AT&T’s upcoming mobile 5G device regarding price, availability, or even form factor (will it be a phone or something more like a hotspot? ), he did confirm that the company will make it commercially available before the end of 2018. Mansfield then added that by getting real devices out in the wild, AT&T will have a leg up on other carriers when it comes to full-on 5G deployment. That said, if you’re even thinking about potentially buying this yet-unnamed 5G gadget, you had better be living in Dallas, Atlanta, Waco, Texas or one of the other nine cities that will get AT&T 5G coverage to this year. As with other carriers, AT&T says its upgrade path to 5G should help improve the company’s existing 4G LTE network. Despite a showy press event at MWC, T-Mobile’s basic plan for 2018 will be to continue its ongoing efforts to upgrade its network to be ready when the first 5G-capable smartphones arrive in early 2019. Currently, T-Mobile says that it will make over 30 cities 5G-ready this year, including New York, Los Angeles, Dallas, and Las Vegas. And it will be the first carrier to support 5G across multiple spectrums (600 MHz and millimeter wave). Additionally, T-Mobile claims that it will be adding over 25,000 5G small cell installations to its network, which should help improve speed and capacity for its 4G LTE service ahead of a full 5G roll out. T-Mobile CEO John Legere also took time out to throw shade Verizon’s way saying “Dumb and Dumber are in a meaningless race to be first. Their so-called 5G isn’t mobile, and it’s not even on a smartphone. It’s a puck? !” However, since Legere also said that T-Mobile 5G strategy is to “play the long game,” his earlier comment seems a bit petty. Like AT&T, Sprint’s announcement at MWC could be seen as a bit overly optimistic, though the company does clearly say that its mobile 5G service won’t be officially available until the first half of 2019. Instead, Sprint claims that due to upgrades made to support 5G in the future, customers in Chicago, Dallas, and Los Angeles will “begin experiencing 5G-like capabilities” such as faster data speeds and increased capacity. It seems Sprint will be leaning heavily on Massive MIMO to help bolster its network, with customers using Sprint’s 2.5 GHz (band 41) spectrum getting the lionshare of the benefits. That said, Sprint is also looking to upgrade its cell sites to support triband service using its 800 MHz, 1.9 GHz and 2.5 GHz bands, which should help extend overall coverage. More specifically, Sprint says that it will be using Massive MIMO radios with 128 antennas (64 transmit, 64 receive) which offer split-mode service that supports both 5G and 4G LTE from the same device. So what does this all this stuff actually mean? In real terms, not a whole ton, to be honest. That’s because even though carriers are upgrading their networks on some places to support 5G, there still aren’t any real 5G devices that can actually tap into those networks. That means we’re stuck with trying to eke out smaller gains that may come due to carriers upgrading their networks. If you are in one of the cities listed above and if you’re on the right carrier and if you have a newish device, it’s possible that you will see some improvement to mobile data speeds and latency. And if you’re really lucky, you might be living in one of the dozen cities that will have access to AT&T’s mysterious 5G-ready device. But that’s a lot of ifs, which means most folks can safely ignore the big 5G spectre looming in the distance for one more year. The one caveat is that if you truly care about being on the cutting edge, you may want to plan your next smartphone upgrade around the actual availability of 5G capable handsets, which should happen sometime in the first half of 2019.